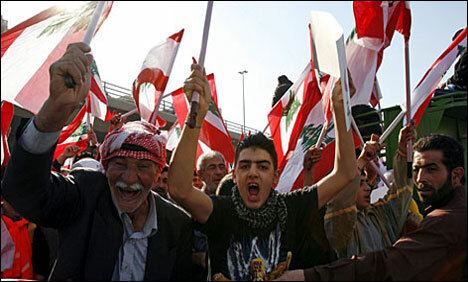 Lebanese are really fed-up with all the constant protests in the street, they were so fed-up that they actually protested against the protests! Now that is how protests should be handled, with just another protest. Dozens of Lebanese, exasperated by rampant tire-burning protests across the country, rolled out tires and stopped traffic in the capital Beirut on Thursday. Police armed with automatic rifles quickly deployed down the street, looking baffled at the small crowd raising the banner “We are tired”, and blocking traffic with colorfully decorated tires. Angry motorists honked their horns. Lebanon, politically fragile after a 1975-1990 civil war, has been plagued for weeks by almost daily demonstrations using burning tires to cut off main highways in to protest everything from political disputes to electricity cuts. Mysterious Orange Goo is Crustacean Egg? Next: Alec Baldwin & Hilaria Thomas Tie the Knot!